It’s the torque (τ) that makes an object spin faster or slower around some axis, just like the force would accelerate or decelerate that very same object when it would be moving along some curve. There’s also a similar ‘law of Newton’ for torque: you’ll remember that the force equals the time rate of change of a vector quantity referred to as (linear) momentum: F = dp/dt = d(mv)/dt = ma (the mass times the acceleration). Likewise, we have a vector quantity that is referred to as angular momentum (L), and we can write: τ (i.e. the Greek tau) = dL/dt. Finally, instead of linear velocity, we’ll have an angular velocity ω (omega), which is the time rate of change of the angle θ that defines how far the object has gone around (as opposed to the distance in linear dynamics, describing how far the object has gone along). So we have ω = dθ/dt. This is actually easy to visualize because we know that θ, expressed in radians, is actually the length of the corresponding arc on the unit circle. Hence, the equivalence with the linear distance traveled is easily ascertained. So it’s all the same-same but different once more 🙂 and so now we also need to point out some differences. The animation below does that very well, as it relates the ‘new’ concepts – i.e. torque and angular momentum – to the ‘old’ concepts – i.e. force and linear momentum. It does so using the vector cross product, which is really all you need to understand the math involved. Just look carefully at all of the vectors involved, which you can identify by their colors, i.e. red-brown (r), light-blue (τ), dark-blue (F), light-green (L), and dark-green (p). The work done per unit of distance traveled: τ = ΔW/Δθ or τ = dW/dθ in the limit. τz = τxy = xFy – yFx (i.e. the torque about the z-axis, i.e. in the xy-plane). Lz = Lxy = xpy – ypx (i.e. 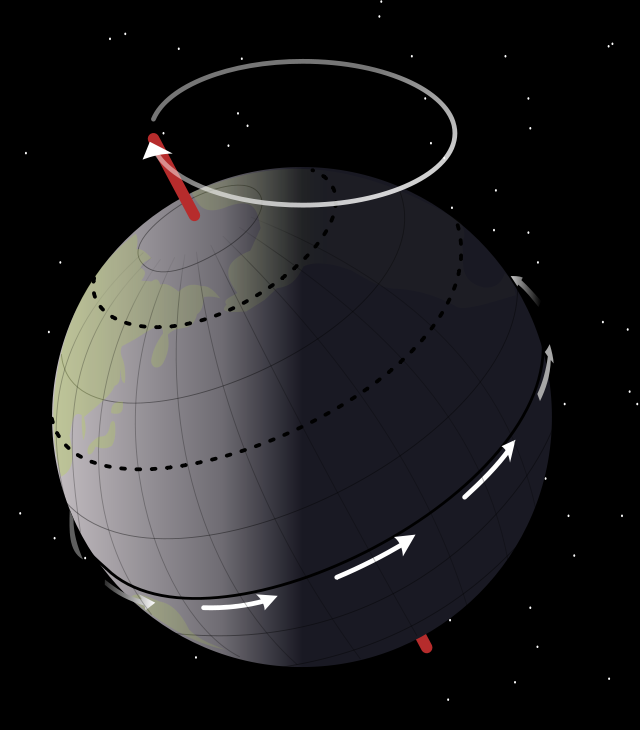 the angular momentum about the z-axis). Let’s now apply the concepts to a loop of current. The geometry of the situation is depicted below. I know it looks messy but let me help you identifying the moving parts, so to speak. 🙂 We’ve got a loop with current and so we’ve got a magnetic dipole with some moment μ. From my post on the magnetic dipole, you know that μ‘s magnitude is equal to |μ| = μ = (current)·(area of the loop) = I·a·b. So that gives the F1, F2, F3, and F4 vectors (so that’s the force on the first, second, third and fourth leg of the loop respectively) the magnitude and direction they’re having. Now, it’s easy to see that the opposite forces, i.e. the F1–F2 and F3–F4 pair respectively, create a torque. The torque because of F1 and F2 is a torque which will tend to rotate the loop about the y-axis, so that’s a torque in the xz-plane, while the torque because of F3 and F4 will be some torque about the x-axis and/or the z-axis. As you can see, the torque is such that it will try to line up the moment vector μ with the magnetic field B. In fact, the geometry of the situation above is such that F3 and F4 have already done their job, so to speak: the moment vector μ is already lined up with the xz-plane, so there’s not net torque in that plane. However, that’s just because of the specifics of the situation here: the more general situation is that we’d have some torque about all three axes, and so we need to find that vector τ.
Well… Yes. It works. Now you may want to know why it works 🙂 and so let me give you the following hint. Each charge in a wire feels that Fmagnetic = qv×B force, so the total magnetic force on some volume ΔV, which I’ll denote by ΔF for a while, is the sum of the forces on all of the individual charges. So let’s assume we’ve got N charges per unit volume, then we’ve got N·ΔV charges in our little volume ΔV, so we write: ΔF = N·ΔV·q·v×B. You’re probably confused now: what’s the v here? It’s the (drift) velocity of the (free) electrons that make up our current I. Indeed, the protons don’t move. 🙂 So N·q·v is just the current density j, so we get: ΔF = j×BΔV, which implies that the force per unit volume is equal to j×B. But we need to relate it to the current in our wire, not the current density. Relax. We’re almost there. The ΔV in a wire is just its cross-sectional area A times some length, which I’ll denote by ΔL, so ΔF = j×BΔV becomes ΔF = j×BAΔL. Now, jA is the vector current I, so we get the simple result we need here: ΔF = I×BΔL, i.e. the magnetic force per unit length on a wire is equal to ΔF/ΔL = I×B. Done! Now, electric motors and generators are all about work and, therefore, we also need to briefly talk about energy here. The μ·B in the U = 1 − μ·B·cosθ formula is just a scaling factor, obviously, so it determines the minimum and maximum energy. Now, you may want to limit the relevant range of θ to [0, π], but that’s not necessary: the energy of our loop of current does go up and down as shown in the graph. Just think about it: it all makes perfect sense! The graph is pretty much the same, but it now goes from −μ·B to +μ·B, as shown by the red graph in the illustration above. Finally, you should note that the Umech = −μ·B formula is similar to what you’ll usually see written for the energy of an electric dipole: U = −p·E. So that’s all nice and good! However, you should remember that the electrostatic energy of an electric dipole (i.e. two opposite charges separated by some distance d) is all of the energy, as we don’t need to maintain some current to create the dipole moment! When introducing mirror symmetry (P-symmetry) in one of my older posts (time reversal and CPT-symmetry), I also introduced the concept of axial and polar vectors in physics. Axial vectors have to do with rotations, or spinning objects. Because spin – i.e. turning motion – is such an important concept in physics, I’d suggest we re-visit the topic here. Of course, I should be clear from the outset that the discussion below is entirely classical. Indeed, as Wikipedia puts it: “The intrinsic spin of elementary particles (such as electrons) is quantum-mechanical phenomenon that does not have a counterpart in classical mechanics, despite the term spin being reminiscent of classical phenomena such as a planet spinning on its axis.” Nevertheless, if we don’t understand what spin is in the classical world – i.e. our world for all practical purposes – then we won’t get even near to appreciating what it might be in the quantum-mechanical world. 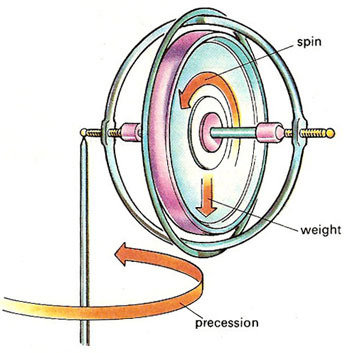 Besides, it’s just plain fun: I am sure you have played, as a kid of as an adult even, with one of those magical spinning tops or toy gyroscopes and so you probably wonder how it really works in physics. So that’s what this post is all about. It’s the torque (τ) that makes an object spin faster or slower, just like the force would accelerate or decelerate that very same object when it would be moving along some curve (as opposed to spinning around some axis). There’s also a similar ‘law of Newton’ for torque: you’ll remember that the force equals the time rate-of-change of a vector quantity referred to as (linear) momentum: F = dp/dt = d(mv)/dt = ma (the mass times the acceleration). Likewise, we have a vector quantity that is referred to as angular momentum (L), and we can write: τ (i.e. the Greek tau) = dL/dt. Finally, instead of linear velocity, we’ll have an angular velocity ω (omega), which is the time rate-of-change of the angle θ defining how far the object has gone around (as opposed to the distance in linear dynamics, describing how far the object has gone along). So we have ω = dθ/dt. This is actually easy to visualize because we know that θ is the length of the corresponding arc on the unit circle. Hence, the equivalence with the linear distance traveled is easily ascertained. However, we also need to point out the differences. The animation below does that very well, as it relates the ‘new’ concepts – i.e. torque and angular momentum – to the ‘old’ concepts – i.e. force and linear momentum. So what do we have here? We have vector quantities once again, denoted by symbols in bold-face. However, τ, L and ω are special vectors: axial vectors indeed, as opposed to the polar vectors F, p and v. Axial vectors are directed along the axis of spin – so that is, strangely enough, at right angles to the direction of spin, or perpendicular to the ‘plane of the twist’ as Feynman calls it – and the direction of the axial vector is determined by the direction of spin through one of two conventions: the ‘right-hand screw rule’ or the ‘left-hand screw rule’. Physicists have settled on the former. The torque is the work done per unit of distance traveled: τ = ΔW/Δθ or τ = dW/dθ in the limit. (1) A dot product, which we denoted by a little dot (·), yields a scalar quantity: a·b = |a||b|cosα = a·b·cosα with α the angle between the two vectors a and b. Note that the dot product of two orthogonal vectors is equal to zero, so take care: τ = r·Ft = r·F·sin(Δθ) is not a dot product of two vectors. It’s a simple product of two scalar quantities: we only use the dot as a mark of separation, which may be quite confusing. In fact, some authors use ∗ for a product of scalars to avoid confusion: that’s not a bad idea, but it’s not a convention as yet. Omitting the dot when multiplying scalars (as I do when I write |a||b|cosα) is also possible, but it makes it a bit difficult to read formulas I find. Also note, once again, how important the difference between bold-face and normal type is in formulas like this: it distinguishes vectors from scalars – and these are two very different things indeed. (2) A cross product, which we denote by using a cross (×), yields another vector: τ = r×F =|r|·|F|·sinα·n = r·F·sinα·n with n the normal unit vector given by the right-hand rule. 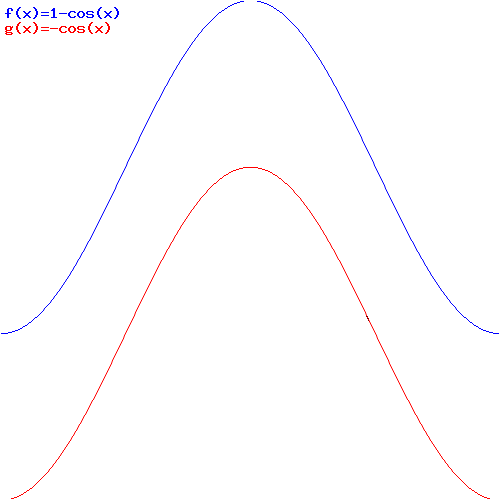 Note how a cross product involves a sine, not a cosine – as opposed to a dot product. Hence, if r and F are orthogonal vectors (which is not unlikely), then this sine term will be equal to 1. If the two vectors are not perpendicular to each other, then the sine function will assure that we use the tangential component of the force. Huh? Yes. This results from a simple two-dimensional analysis of what’s going on in the xy-plane: the force has an x- and a y-component, and the distance traveled in the x- and y-direction is Δx = –yΔθ and Δy = xΔθ respectively. I won’t go into the details of this (you can easily find these elsewhere) but just note the minus sign for Δx and the way the x and y get switched in the expressions. (3) τzx = zFx – xFz. (3’) τz’x’ = z’Fx’ – x’Fz’. Now, of course, there must be some ‘nice’ relationship that expresses the τx’y’, τy’z’ and τz’x’ values in terms of τxy, τyz, just like there was some ‘nice’ relationship between the x’, y’ and z’ components of a vector in one coordination system (the x’, y’ and z’ coordinate system) and the x, y, z components of that same vector in the x, y and z coordinate system. Now, I won’t go into the details but that ‘nice’ relationship is, in fact, given by transformation expressions involving a rotation matrix. I won’t write that one down here, because it looks pretty formidable, but just google ‘axis-angle representation of a rotation’ and you’ll get all the details you want. And we note, once again, that only the y-component is non-zero in this case, because the rotation is about the y-axis. cz = axby – aybx. I could continue to write and write and write, but I need to stop here. Indeed, I actually wanted to tell you how gyroscopes work, but I notice that this introduction has already taken several pages. Hence, I’ll leave the gyroscope for a separate post. So, be warned, you’ll need to read and understand this one before reading my next one.